The annual movement of wildebeest across the Serengeti-Mara ecosystem is one of the greatest spectacles in the natural world. Originating on Tanzania’s short grass plains of the southeastern Serengeti, the dwindling of the available grass is the impetus for this primal trek. The horizon fills with 1.5 million wildebeest, 200 000 zebra, 18 000 eland and 500 000 Thompson’s gazelle, relentlessly tracked by Africa’s great predators. Essentially, the wildebeest are taking advantage of the strongly seasonal conditions, spending the wet season on the southeastern plains of the Serengeti in Tanzania, and the dry season in the woodlands of the Masai Mara. The wildebeest give birth between January and March on the short-grass plains. The Migration is rarely the same in terms of precise timing and direction, as local conditions influence grass growth. The wildebeest may therefore move off the open plains earlier in some years, and remain in the northern woodlands for longer in others. Typically, they head slowly northwest towards the western corridor of the Serengeti and the Grumeti River. From there, the herds move north before crossing into the Masai Mara. Here, they must ford another river, this time the Mara. The Migration remains on the productive Mara grasslands until the storm clouds gather in the south, and they return to their breeding grounds. These luxurious tented camps move around the Park year round, bringing guests within reach of the Great Migration and exploring remote, beautiful corners of the Serengeti with excellent resident game. Using only private campsites, these migratory camps are entirely intimate and exclusive, featuring Tanzania’s most spacious safari tents, each with double bed, ensuite bathroom, separate w.c. and al fresco bucket shower. Experience a classic Tanzanian safari in spectacular solitude and soothing comfort – with only the canvas walls of your tent separating you from the wonder of the Serengeti. Carefully positioned for close proximity to the wildlife herds of the Great Migration, our two Serengeti Under Canvas camps provide the ultimate viewpoint for this amazing animal spectacle. With only eight tents nestled at each private campsite, enjoy the indulgence of complete comfort combined with the authenticity of nights spent in the African bush. Carefully planned to bring guests as close as possible to the magnificent natural spectacle of the Great Migration, the two Serengeti Under Canvas camps are situated at a variety of private campsites throughout the national park and move according to the path of the migratory herds. A comfortable drive brings guests into the midst of moving masses of wildebeest and zebra, ready to witness the natural drama as herds brave obstacles and predators to reach rich grasslands. The solitary magnificence of the Serengeti is offset by the warm service and simple luxury of our comfortable tented accommodation. From the moment you awaken to the sound of the al fresco bucket shower in your ensuite bedroom being topped up with hot water your natural adventure has begun. Crisp linens and crystal chandeliers in your spacious tent lend of air of extravagance. The simplicity of camping, with no mains electricity and running water, is softened by convenient touches like a flush w.c, power outlets in the vehicles and a personal butler. A dedicated sitting and dining tent provides deep sofas from which to contemplate the vastness and peace of the surrounding landscape. Custom made Indian rugs and polished brass samovars add a touch of elegance and romance. Relax under the dark velvet night sky and sample hearty cuisine served on sparkling crystal and silver that reflects the sparkling light of millions of shining stars. Cluster around a roaring campfire to share stories of the day’s magic and listen to the African night come alive. At Serengeti Under Canvas the days are designed to thrill you with intimate wildlife experience and the nights to delight you with the romance of canvas under open African skies. • Morning Game Drive – As dawn breaks over the Serengeti, the deep voice of your butler delivers a wake-up call at your tent. A tray of tea, coffee and homemade biscuits will be waiting outside your tent. Climb into an open 4×4 safari vehicle with your guide and set off in search of the massed herds of the Great Migration. If the herds have already moved on into Kenya, your guide will introduce you to the rich resident wildlife. • Breakfast – After a morning spent tracking down wildlife, return to the camp for a hearty bush breakfast. Feast on platters laden with toast, jams and marmalades, homemade muesli, fresh fruits and assorted cheeses. Hot breakfasts are prepared on the open fire, with eggs, omelettes, frittatas and freshly cooked pot breads. • Lunch – After breakfast, indulge in a steaming hot bucket shower or maybe a quick nap before lunch. Inviting lunch platters are served in the cool shade of the dining tent. • Afternoon Tea – While away the afternoon hours with a good book and a chilled glass of wine in the guest tent or simply watch the wonders of the bush directly from your tent’s veranda. Afternoon tea, with a selection of ight snacks, will be served in the late afternoon. • Afternoon Game Drive – Depart on an afternoon game drive as the heat of the day starts to break. Keep an eye out for lion, leopard, hyena and jackal gearing up for their nocturnal hunts. • Dinner – As you arrive back at the camp, cocktails are served around a blazing fire. Dine under the stars on a delicious bush meal cooked on the open fire. After dinner, indulge in decadent desserts, served with tea, coffee or cognac. Stories from an adventurous day are shared around a glowing campfire. 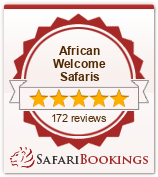 You will then be escorted back to your tent, where you will drift off to sleep amidst the sounds of the African bush. At Serengeti Under Canvas, it is our passion to share our knowledge and understanding of the bush and its inhabitants with our guests. Our highly trained guides trackers will do their very utmost to delight our guests. • Twice daily game drives – explore the endless plains of the Serengeti on early morning and late afternoon / evening game drives in an open 4×4 safari vehicle. Morning game drives begin as the sun is rising and the nocturnal predators are ending their nightly hunts. There is always the chance of seeing a pride of lion lingering over last night’s kill or a leopard relaxing on a branch where it has wedged its prey. The smaller denizens of the bush come to life as the daylight hours make it easier for them to spot any predators still on the prowl. In the late afternoon, sit in the midst of antelope, buffalo and elephant as they make their way down to the river, either singly or in herds, for a last, refreshing drink. Serengeti Under Canvas is carefully positioned in an attempt to always be within easy driving distance of the massed herds of the Great Migration and game drives focus on finding the wildebeest and the various carnivores that accompany them. Should guests prefer, the two daily game drives can be replaced with one, much longer, daily outing, with a picnic lunch provided.